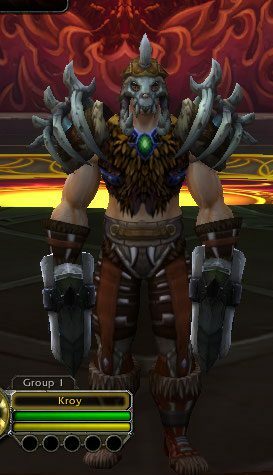 Despite my interest in transmog, I wasn’t too excited about the Trial of Style. None of the mog prizes were that exciting to me. The only one I really wanted was the mail set. I would have totally forgotten about the event altogether until I saw someone on my friends list queue for it. So I figured, ok, I’ll go get that set and be done. I queued up my hunter first since that was the set I wanted. She went in blind with no idea what she was in for. I didn’t do so well but at least now I understood how it worked. And it was FUN! It took a few rounds to get the tokens I needed and then I put her away. Next day I thought You know, that was pretty fun. I should take my main mage and make him some theme sets ahead of time and see how he does. So I made him a few sets of the themes that I had seen already and queued him up. Naturally, the first theme was one I hadn’t seen before so I had to create something on the fly. 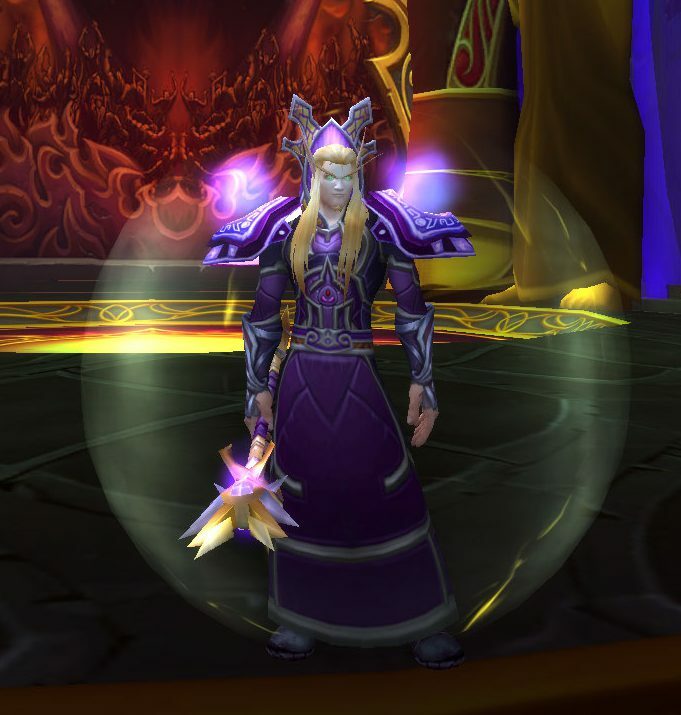 Being a belf, he has an extensive wardrobe, so it was pretty easy to come up with an Epic Purples outfit. And he won! First try. Go figure. So then I thought, well, I might as well get the plate, too. So I made some outfits for Kerick. Faction Pride came up, and I had the Stormwind Guard transmog from the Draenor garrison thing already saved up and ready to load. Yeah, it’s a set, not a unique mog. I figured that was a mark against it, but apparently it didn’t matter. It won. Then there was the rogue. I have an extremely limited leather wardrobe, so I wasn’t sure how that would go. But his Primal Style outfit won. It seems like tying together a look ahead of time does make a difference. As you can see in the shot which has the top three all on the podium, the other two had the right idea. But their outfits were just a little too thrown together and mishmash to stand up to the cohesive design. Could I have thrown this together in 2 minutes and had it look like this? Probably not. Planning ahead does pay off. And here is a better shot of him by himself. I really hope they do this again, preferably not just once a year. It would be nice if they added some new prizes. I think people really enjoyed this. I know I did! 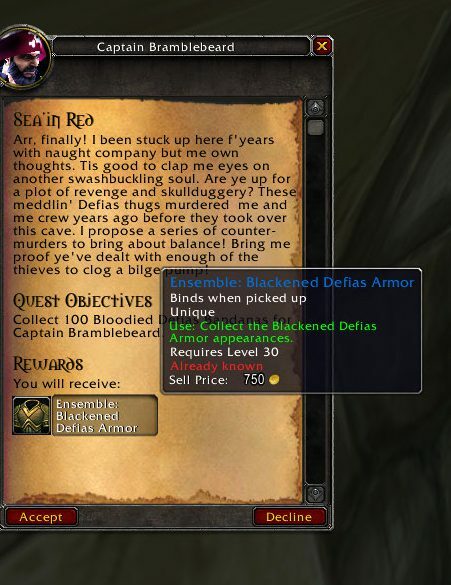 So yesterday Z posted about the ‘new’ Defias armor transmog set that you can get through a quest in Deadmines if you are an outlaw rogue. Check out her post if you’re interested in getting this set, she has a great write-up. So I wandered over there and stealthed through killing bosses only. But when I got to the ship room with my Green-Wing Macaw out and grappeled up to the Cap’n, this happened. Funny story, too, you know how that fire mage I’m playing as my main right now was my Horde bank alt for the last however many expansions? 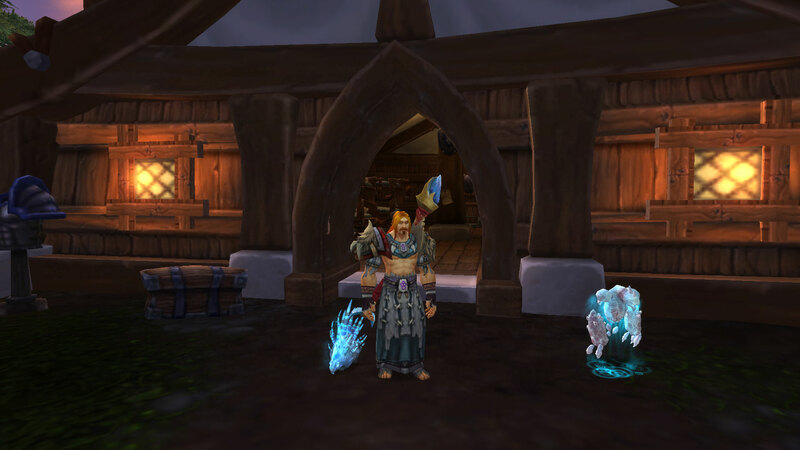 Yeah, well, Kroy spent the better part of his existence as my Alliance bank alt. 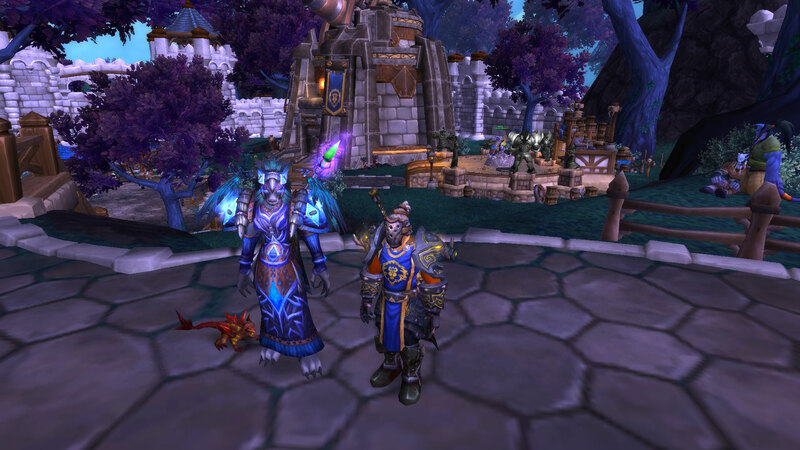 Neither of them made max level before the pre-Legion demon invasions, and now they are both among the characters that I have already worked on leveling this time! The outlaw fighting style is always what I had imagined for Kroy, so it just seemed like the perfect time for his character to develop. Ok, I’m back! Mom was here for 5 weeks and we had a lot of fun. But I couldn’t play while she was here. 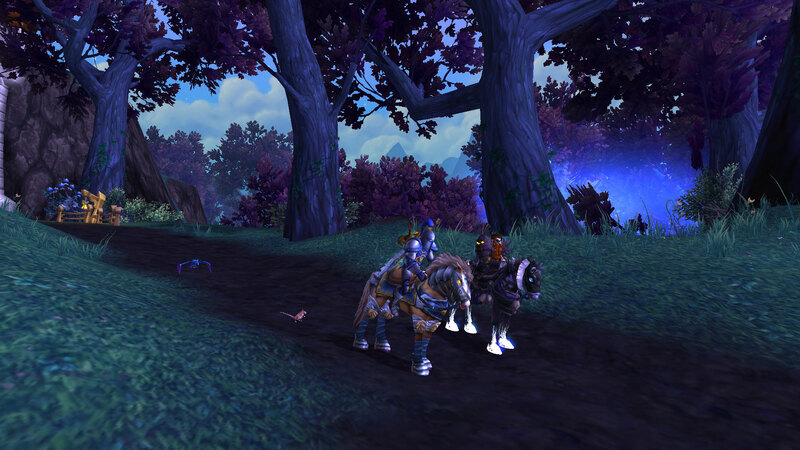 SO … now that most of you are sick of Tanaan, I am just getting started over there. 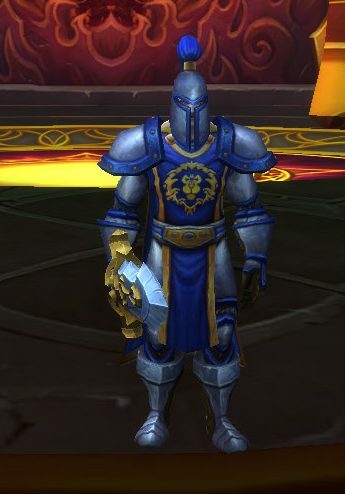 The first thing I did, now that you can mog Admiral Taylor’s weapons, was to put Sanbec in the Stormwind guard armor you get from the War Mill and add the good Admiral’s swords. Put him on the palomino and damn he looks hot. He did a couple of dungeons this weekend because it was the bonus rep weekend (not mythic, just regular), got honored with the main Tanaan faction so he could build battleships, and faked his way through the first wing of LFR. I didn’t even read the Blizzard Watch 5 minute guide to the wing, I just went in blind and followed the minimal instructions handed out in chat. I mean, it was Tuesday LFR, you know? I’ll do another wing tonight and actually read about it this time (maybe). Oh yeah, and it’s Faire time, too! Surprisingly, it only took two tries to get myself a Hogs. I was a little bit disappointed that he’s so small, but oh well. That’s what biscuits are for, right? Oh yeah, I finally got Syd this week, too, but I forgot to take a screenshot. I know a lot of people get excited for Tuesdays because of raid resets. Me? I get excited because my Inn resets and I can recruit a new follower! Juna recently got Soulare of Andorhal. 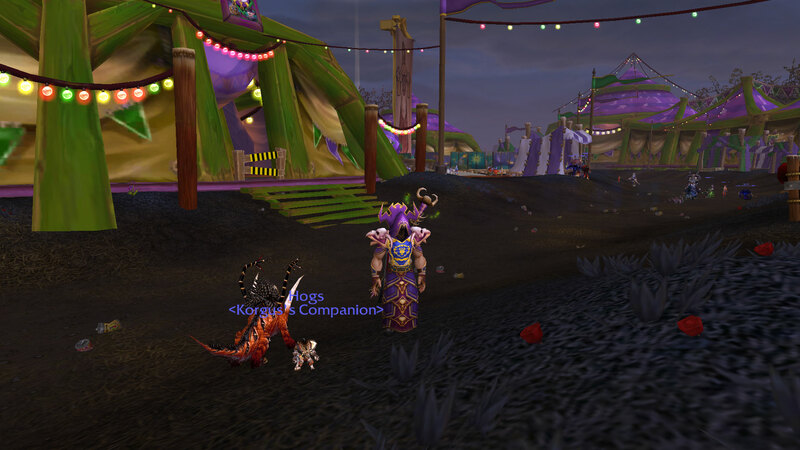 If you do a /tired emote at him, he will /comfort you and give you something for your toybox, so if any of you are Horde and want to come meet him, hit me up. Each of my characters has certain preferences. Sanbec seems to have a thing for Worgen ladies, like Permelia. In addition to her, he also recruited a feral druid, Seline Keihl, and of course he has Fiona as well. You can see my solution for the ugly new human face. Thank the Light I saved that helmet. Karius, however, has gone the opposite route … very much the opposite, exposing as much as possible. Yeah, that’s right, the poor neglected mage who never even made max level in Pandaria is now the second Alliance character to reach Draenor … in large part because of the clothing options. What? Blame Elgar. Can’t leave Van out, though … we need some Horde content here too. 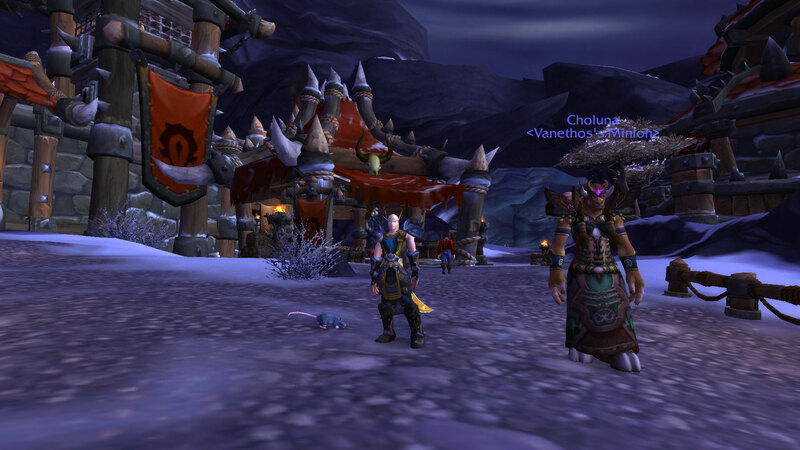 He finished up the garrison campaign this week and got Choluna. He also finished the bro stone grind and subdued Garona, so he is all ready to move on to Blackrock Foundry when it opens.